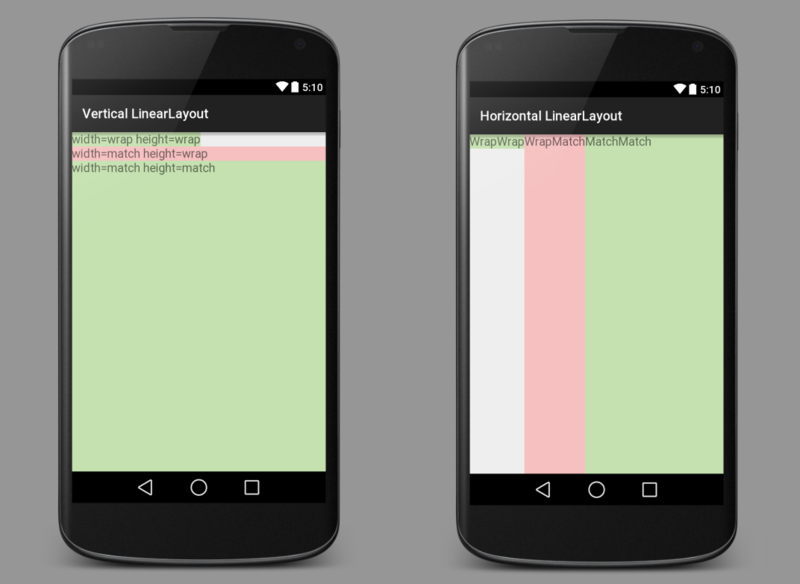 In Android, when layout out widgets, what's the difference between fill_parent (match_parent in API Level 8 and higher) and wrap_content? Is there any documentation where you can point to? I'm interested in understanding it very well. Either attribute can be applied to View's (visual control) horizontal or vertical size. It's used to set a View or Layouts size based on either it's contents or the size of it's parent layout rather than explicitly specifying a dimension. Setting the layout of a widget to fill_parent will force it to expand to take up as much space as is available within the layout element it's been placed in. It's roughly equivalent of setting the dockstyle of a Windows Form Control to Fill. Setting a top level layout or control to fill_parent will force it to take up the whole screen. Setting a View's size to wrap_content will force it to expand only far enough to contain the values (or child controls) it contains. For controls -- like text boxes (TextView) or images (ImageView) -- this will wrap the text or image being shown. For layout elements it will resize the layout to fit the controls / layouts added as its children. It's roughly the equivalent of setting a Windows Form Control's Autosize property to True. There's some details in the Android code documentation here. The border of the child view expands to match the border of the parent view. The border of the child view wraps snugly around its own content. Here are some images to make things more clear. The green and red are TextViews. The white is a LinearLayout showing through. Generally that is not as good, though, because it is not as flexible for different sized devices. After you have understood wrap_content and match_parent, the next thing to learn is layout_weight. The explanation in this answer assumes there is no margin or padding. But even if there is, the basic concept is still the same. The view border/spacing is just adjusted by the value of the margin or padding. fill_parent will make the width or height of the element to be as large as the parent element, in other words, the container. wrap_content will make the width or height be as large as needed to contain the elements within it. A component is arranged layout for the fill_parent will be mandatory to expand to fill the layout unit members, as much as possible in the space. This is consistent with the dockstyle property of the Windows control. A top set layout or control to fill_parent will force it to take up the entire screen. Set up a view of the size of wrap_content will be forced to view is expanded to show all the content. The TextView and ImageView controls, for example, is set to wrap_content will display its entire internal text and image. Layout elements will change the size according to the content. Set up a view of the size of Autosize attribute wrap_content roughly equivalent to set a Windows control for True. Not the answer you're looking for? Browse other questions tagged android layout user-interface or ask your own question. How can remove padding or margin in Tabwidget in android? Why does edittext with empty text still have some height?